I have a big stash of picture frame molding that I'm always using for different projects. I've used it on my 4 ft wooden butterfly, my 5ft dragonfly, the kitchen hutch makeover and on my bookshelf makeover...just to name a few! Check out the "things to make with molding" category to see more ideas. to use some of it to make funky letters and words. I love the mismatched look of all the combined molding. I cut the angles with my miter saw and attached them together with wood glue. I also used little pieces of wood to connect the corners (attached on the back). This molding already had the whitewashed distressed look. and painted with an olive leaf pattern. This set of molding letters was a sign I made for a local bakery. 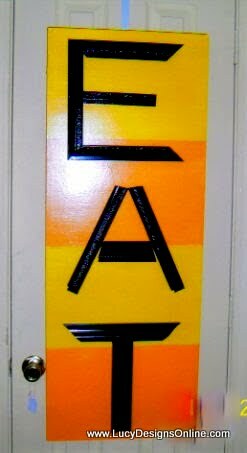 I spray painted the letters in glossy black and attached to a striped, painted board. Thanks for checking out my picture molding letters!